Today our group went to two of the publicly accessible caves that Sarah, Elena, and Savannah had sampled from last year—Indian Tunnel and Buffalo Cave. Indian Tunnel is one of the most popular publicly accessible caves, and the inside is lit by a large skylight. Since our focus is on chemotrophic organisms, we avoided sampling near the skylight and went to the darker region of the cave. There, we found that one of the larger deposits that was sampled last year had disappeared, so we observed that the deposits can vary a lot from year to year. Since we hope to come back in the winter to study the variation between seasons, the indication that the deposits vary annually is an important piece of the puzzle as well. Next we went to Buffalo Cave, which had more abundant deposits than we had seen anywhere else. We were all a little in awe as we walked through the cave, stopping every few meters to point out another interesting feature. The variation in color, and particularly texture, was readily apparent in these samples: we observed smooth deposits that flaked off while we were sampling, and little branches deposits that looked like corals. We collected three kinds of samples, one of which was so abundant that we collected 9 vials of it—a promising chance to explore not just the population composition, but also the kinds of RNA and protein that are most abundant in the sample. This analysis will give us a better understanding of how the microbes in the deposits survive and the metabolic processes they’re employing. These samples should give us a lot to work with back in the lab to expand our understanding of these populations, how they survive, and how they’re affect patterns of mineralization. This entry was posted in Idaho 2017 on August 12, 2017 by Julie Bevilaqua. 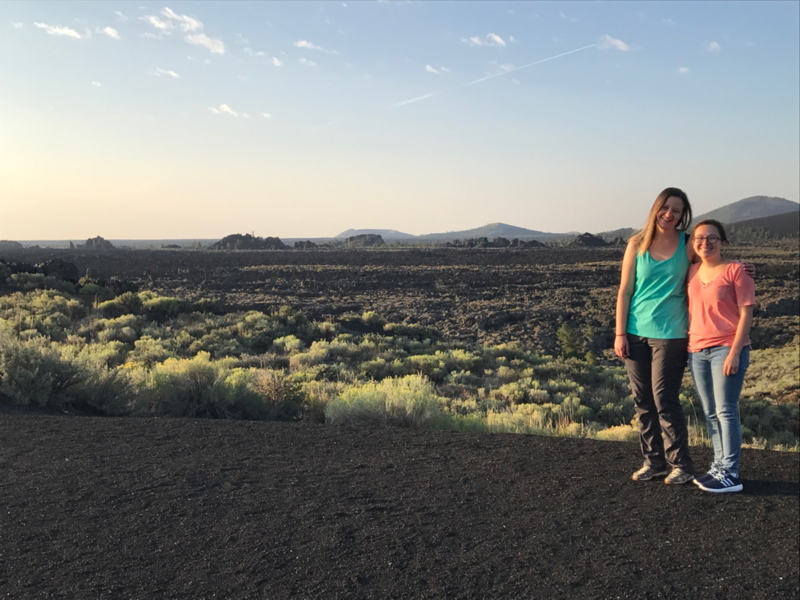 On Friday, Elena, Kate, and I joined more of the FINESSE team in a trip to Big Craters, where there is a large ridge of basalt lava flow that NASA’s BASALT team has previously studied. 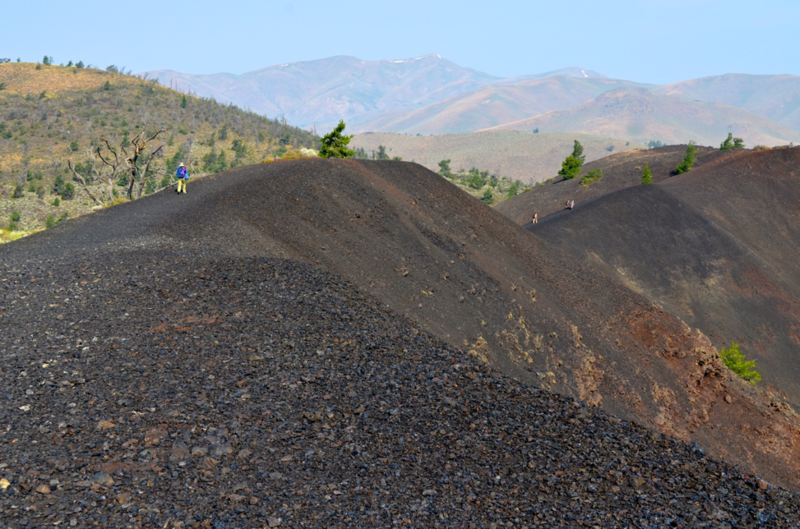 We hiked along a high ridge to access the sample site, where we saw some incredible views of the surrounding park and the nearby spatter cones, which are mounds of lava that form around a main channel. We climbed up the lava flow to find the site previously sampled by the BASALT team, where we took samples for DNA, RNA, and protein analysis of unaltered basalt lava. Unaltered basalt is dark black in color, while the color of altered basalt lava is often changed because of chemical reactions. Lava that has already flowed out and cooled can be altered via oxidation, making turn a rust-red color, or through reactions with hot gases released later in the flow. We weren’t able to access the site for altered basalt that had already been sampled, so we trekked back along the ridge to prepare for the afternoon. We then went on to the Highway flow—named because it sits directly across the highway from the Visitor’s Center. Shannon, one of the FINESSE project leads, took us along the flow, which is steep and jagged, with crevices throughout, making it hard to navigate without a guide. Before we entered the main body of the flow, we stopped to take in the rugged expanse, which Shannon told us is often referred to as Mordor (it’s a fitting name). After scrambling through the lava rocks, we found two sites—one of altered basalt that had been sampled before by the BASALT team, and another of unaltered lava that was nearby. The unaltered basalt was particularly tough to sample—it’s incredibly dense and hard, but we managed to break off enough for our analysis before setting off out of the flow and toward the highway again. The two samples from the Highway flow will give us a great means of comparing the microbial populations in the altered and unaltered basalt, and since the NASA team has sampled here before, we’ll be able to compare our results to their findings as well. We’ll have a great set of samples to work with when we get back to the lab. We’re rapidly filling the cryoshipper to take them all home. This entry was posted in Idaho 2017 on August 11, 2017 by Julie Bevilaqua. On our first day of field work, we went out to Arco Tunnel, one of the longest lava tubes at Craters. Arco Tunnel is of interest to us because it’s no longer accessible to the public, so there’s less risk of contamination, and there’s no light inside, so we can focus in on non-phototrophic microbes. We were fortunate to have a great guide from the National Parks Service, two interns from the Bureau of Land Management, and Kate with us—Arco Tunnel is difficult to navigate, and we definitely needed help to avoid getting lost! 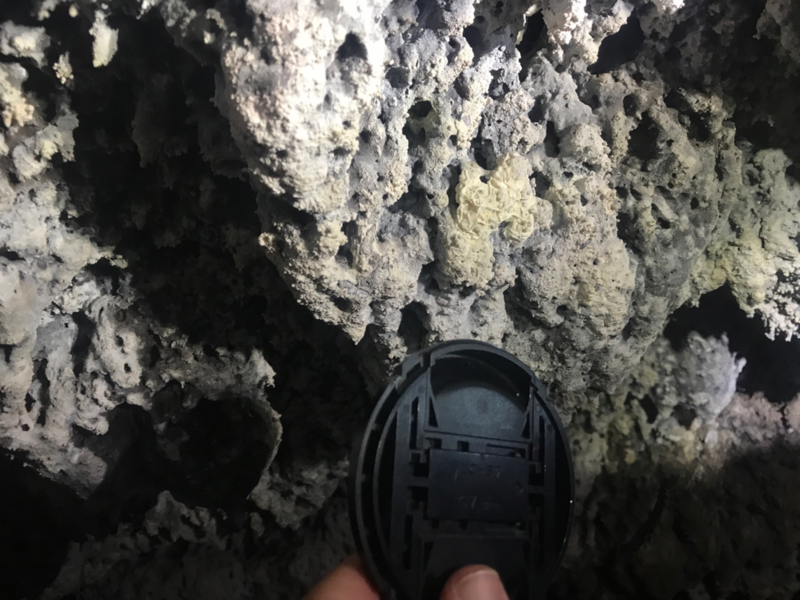 After crawling and scrambling throughout the day, we found some great sample locations and collected from 11 different sites throughout the cave. Temperature and humidity also varied widely throughout the cave, from around 10 ºC (~50 ºF) to 18.8 ºC (~66 ºF) in a room closer to the surface. Hopefully this contextual data will help us in our analysis, both to understand gradients within Arco Tunnel and to compare to the sites from our other field days. It’s amazing to see the diversity of colors and textures that exist in the caves, from white crystalline mineral deposits on the ground to yellow biofilms clinging to stalactites on the ceiling. The range of microenvironments we observed in the cave likely helps facilitate some of this diversity, but it’s incredible that despite no access to light and very few sign of other life, so many populations of microbes have found their own way to survive in the cave. We’re excited to see what results we get from sequencing these samples so that we can understand who is surviving there, and how! This entry was posted in Idaho 2017 on August 10, 2017 by Julie Bevilaqua. 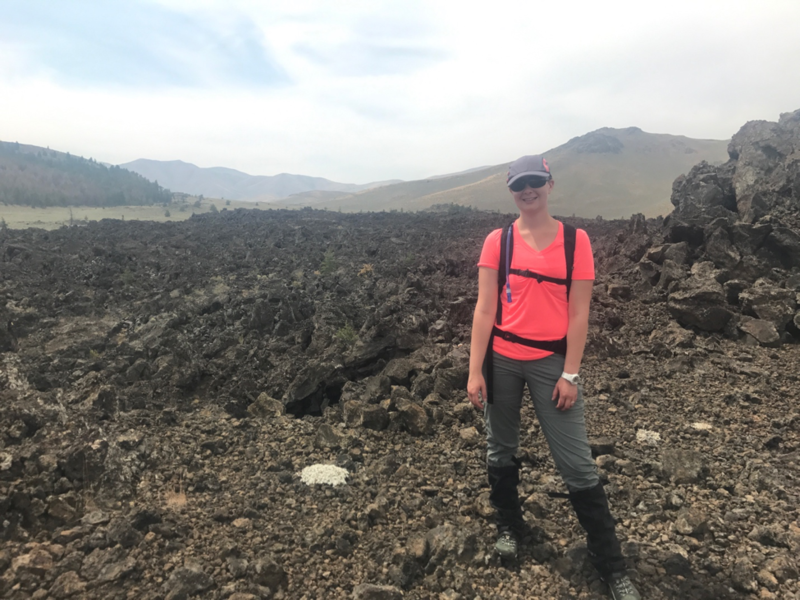 Elena and I are traveling to Idaho to study extremophiles at Craters of the Moon National Monument and Preserve, which is often used as a Martian and lunar analog environment. We’re heading there with NASA’s FINESSE and BASALT teams, which come every year to study the lava flows on the surface and the lava tubes, which are caves carved out by lava flow. Much of the surface of the Moon and other bodies in the solar system is marked by volcanic activity, so Craters is a great place to expand our understanding of these features on Earth in order to be better equipped to work with them in space. Elena and I are looking to study mineral deposits in the lava tubes because subsurface environments are considered one of the important places to look for life on Mars, since they provide more protection from radiation than the surface environment. 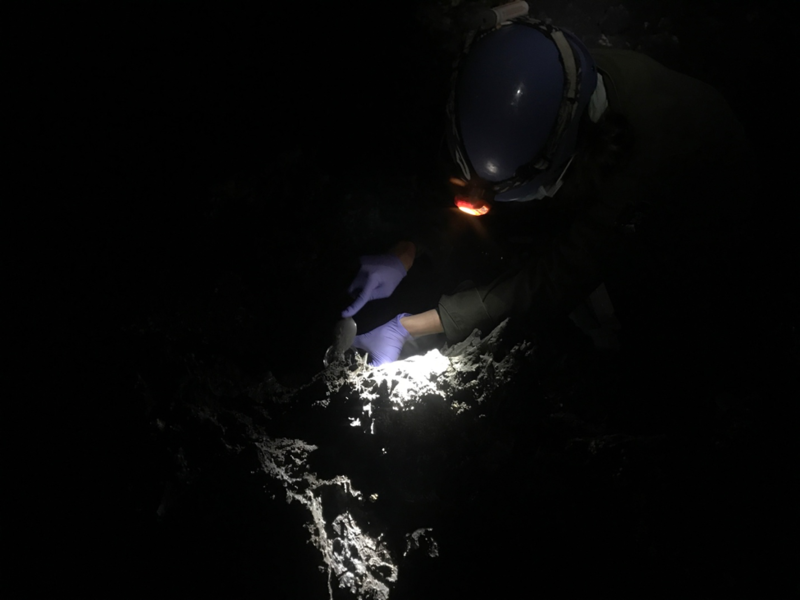 Since many of the mineral deposits are formed by microbes, we will take samples to sequence later so that we can get a sense of the microbial populations and activity in the lava tubes. We’ll also be joined in the field by our collaborator Kate Craft, from the Applied Physics Lab at Johns Hopkins. Together we’ll be collecting organically clean samples—samples without contamination from outside organic molecules, like those that might be on our instruments or gloves—to look for biosignatures that may have been preserved in some of the deposits. By comparing our sets of results, we’ll be able to target the same questions through multiple kinds of analysis, which will give us a much bigger picture of life in the harsh conditions of lava tubes! This entry was posted in Idaho 2017 on August 8, 2017 by Julie Bevilaqua.